2012: “Food insecurity: The impact on African women and children” in Gendered Insecurities, Health and African Development, edited by Howard Stein and Amal Fadlalla, London: Routledge,2012. “Child Poverty: the Gender Dimension” in Child Poverty: African and International Perspectives, edited by J.E. Doek, A.K. Shiva Kumar, D. Mugawe, and S. Tsegaye. Antwerp: Intersentia, 2009. 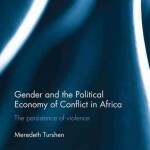 “The Political Economy of Violence against Women during Armed Conflict in Uganda.” reprinted in Cultures of Fear: A Critical Reader, edited by Uli Linke and Danielle Smith, Pluto Press, London, 2009. “Population Growth and the Deterioration of Health: Mainland Tanzania, 1920 1960.” In African Population and Capitalism: Historical Studies edited by D. D. Cordell and J. W. Gregory, 187 200. Boulder: Westview Press, 1987; republished Madison: University of Wisconsin, 1994.